A new bypass in Gwynedd could boost an airfield's aerospace ambitions, enterprise chiefs have said. Snowdonia National Park Authority has approved the plans to build a mile long diversion on the A496 near Llanbedr to ease congestion. It is hoped it will improve access to Llanbedr Airfield which is aiming to play a role in future space travel. 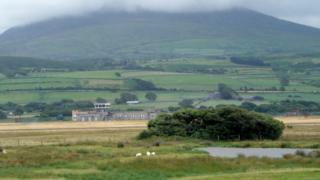 The airfield is currently used for testing and developing unmanned drone aircraft for civilian use. In July, the site, also known as know that Snowdonia Aerospace Centre, narrowly missed out on becoming the UK's first spaceport, but experts have said it could still be in the running for other projects. About 15 companies and 50 workers are based at the airfield. Dr John Idris Jones, chairman of the Snowdonia Enterprise Zone advisory board, said: "We want the world's technology companies to know that Snowdonia Aerospace Centre is open for business, and the development of a quality access road makes that message very clear." Gwynedd council has developed the plans for the bypass which would also ease traffic for people visiting nearby Shell Island. Work is expected to start in 2019 and take around 12 months to complete.